Arrived here around 4:00 PM so we made excellent time considering we left home at 4:30 AM and stopped about 4 times. Long drive, but worth it just to see the changing leaves and view here. 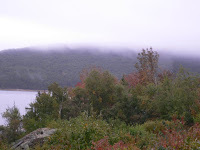 It's mysteriously foggy, which creates a wonderful backdrop for the sound and the mountains and trees. 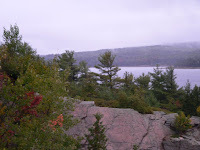 Our temp landlord tells us that Somes Sound is actually a fjord - will have to research that. 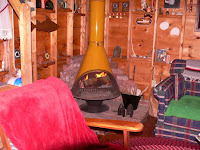 The tiny cabin is absolutely adorable - the coziest ever - especially with the fire M built in the little corner not quite pot-bellied stove. Rustic doesn't begin to describe the quaint and homey feel of this little place. We love it. Scotties are conked out - they did so well travelling up here but as usual Aspri suffers from motion sickness; even the Dramamine can't quite fix that entirely. But we think they'll have a ball here hiking and exploring, and I know we'll enjoy the quiet. Although.....quiet might not be what happens over the next few days - someone said there's a hurricane or at the very least a nor'easter headed this way? Gack.